Rio Tinto’s boss Sam Walsh is dead right when he says, “We’re missing out on 32% of the talent that’s out there”, because of the gender gap in his company. But women’s lack of confidence isn’t to blame. Walsh said he “is looking to fill the company’s senior ranks with more women”, but says “female employees need to be more confident”. Rio Tinto’s latest Workplace Gender Equality Agency report for 2014-2015 shows Rio’s overall female participation at 18.5% of the workforce and with a slightly higher rate of 22.6% as female managers and executives. This is on par with the resources industry average of 17% female participation overall. The good thing about resources is that they know that they have a gender balance problem, and they want to fix it, not just as a feel good measure but because they know that it will increase productivity and performance. The Centre for Gender Economics and Innovation works with the Australian Mines and Metals Association (AMMA) to roll out the AWRA recognised program™ to increase women’s participation in that sector. Walsh offers the idea that women don’t always have the confidence to come forward; unlike men who can be over confident when it comes to their ability, women might hang back and not feel confident enough to promote themselves in the same way as men. Whilst this might be the case for some women, it is a generalisation and an oversimplification of the issue. The issue of women not being more visible is a result of long entrenched structural barriers in the way that we design and manage companies, behavioural expectations for leaders and cultural norms that can hamper women. I have interviewed many hundreds of men and women in my work and have found that many women still constrain themselves as the family’s primary carer, even when they are being offered a senior promotion at work. This often converts to a supporter mentality that, when coupled with a woman’s more collaborative management style, can be seen by men as less confident. Organisations, however, can do a lot to harness these valuable assets by redesigning their leadership structures and building in the attributes of a leader rather than just recognising skills and experience, which more often favours men. This process tends to highlight structural barriers based on values judgements and stereotypes, which once removed will benefit everyone. Research conducted by the Centre for Gender Economics and Innovation worldwide shows a clear link between improved gender diversity and business performance. It’s common-sense but many organisations are still unsure how to increase gender balance. This is because they continue to look at the same old human resource solutions rather than looking more broadly at how they have arrived at their current position and then over lay that with a gender lens – this is Gender Economics. Gender diversity remains one of the great frontiers in unlocking business underperformance and setting up a business culture for performance. It’s the next business transformation. Yes sorry, HR people! Its true, Gender Diversity is NOT a Human Resources issue – it is an organisational opportunity! Yes that’s right folks, it is all about the opportunity of opening up your organisation to INNOVATION through DIVERSITY and GENDER BALANCE. So often we think of diversity as just talking about women, but that is not the case. Increasingly, cultural diversity is the opportunity to reap the benefits of different perspectives, practices and culture. Overlay this with gender balance and you get even more benefits. A culture that embraces diversity will naturally be more attractive to women, and will most likely benefit your entire staff, the community and the environment as well. Sure, it is complex, but that’s where the real benefits are – in managing COMPLEXITY. Imagine managers who are able to proactively manage across all aspects of a diverse environment. Imagine the opportunities for your business. So often when I speak to organisations about diversity and gender, and they say the same thing: “We created a Diversity Council, and now we just don’t know where to go from here”. Or, I get the comments that organisations have come to a standstill when it comes to increasing gender balance. That’s often because they have diversity installed in the human resources area of the business, or are relying on HR professionals to solve the challenges of the whole organisation when it comes to the management of complexity. We are taking the wrong approach to this challenge. What is the first thing that gets done in terms of creating programs to attract and retain more women? Generally a Business Case – what for? A Business Case for Women? No one creates a Business Case for Men to work in an organisation. Think about it and that will go some way to uncovering the barriers to change. Change is being managed within the same old paradigms that created the ‘Business Case” in the first place, as a justification to spend or to commence an activity, but diversity should not need a justification. Innovation doesn’t need to be justified when it happens, but it doesn’t happen in a vacuum. An environment that embraces and promotes an organisational capability of Innovation and Diversity has been created by the entire organisation. Sure HR is involved and often a lead player, but unless the change in culture is embraced by senior management and promoted as the new culture, nothing will happen, or it won’t be sustainable. Worse still, it may be seen as a failure and this is what is happening with many diversity programs. They start, they create the Diversity Council and then they stall. The Diversity Program Review Framework™, the DPRF™ can help your organisation to identify areas where innovation and performance can be improved by embracing diversity. Many of the recommendations developed for organisations through this process are already paying dividends and giving those organisations a ‘competitive edge’. This is a business opportunity, not an HR issue. 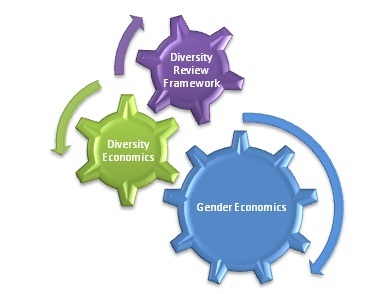 If you would like more information about the DPRF, and how your organisation can be assessed for a DPRF International Award, head to our website or contact me at susanne.moore@gendereconomics.org for more details. Can you imagine a world where each morning you wake up and face a day where you find that you are going out into a world that throws obstacles in your way at every turn and when you try to explain those obstacles, you just cannot? You know they exist, you feel the results of them; you know that some people treat you differently. Sometimes people talk as if you don’t exist, or worse make light of what you are saying whilst you are standing there as if you aren’t there at all. You know something is happening that feels like exclusion but when someone asks, you are not able to explain what you mean. You know you could have a better job, you could have more money and you could feel more in charge of your life but somehow these simple things elude you. People around you tell you that you should be grateful for what you have and that you should not worry. You are so lucky and other people wish that they were just like you, but you feel that every day you are fighting against issues and inequalities that are sometimes overwhelming. They drain you and worry you, and ultimately drag you down making you weary and less inclined to speak up again tomorrow. In fact, the tiredness silences you. Sadly, this is how many women feel way too often. It might be that we do way more housework than our partners, and we are just sick of asking them to step up. Alternatively, that you have put off something important so many times because you feel guilty that you aren’t doing what you should be doing, these thoughts of something better just get pushed to the background yet again, and you feel hopeless. It is hard because there is a complex array of inequalities that are both seen and unseen and although it seems like some barriers have been removed, in practice they still exist and you feel constrained and not able to live up to your full potential. It might be because you are just living over the poverty line as a single parent and each day is a struggle. You feel you don’t have a voice and the more you try to get ahead the harder each day seems to get. Each year another government policy comes into force that is supposed to ‘help you’, but instead creates even more complex issues for you to overcome, and you get more weary and less inclined to try each time another setback happens. It might be that we feel we work really hard at our jobs, are highly educated and productive but are continually passed over for promotion year after year when we see the promotion go to someone we know is less productive and less capable. On the other hand, that you hear on the news that ‘only 17 countries have a female President or Prime Minister and women’s average presence in parliaments across the globe is only 21% of the total ministers. Recent actual voting data using the Chilean voter model, found that women were less likely to vote for a women than they would for a man’ regardless of policy (Francisco Pino, 2013)[i]. You wonder, “why don’t women support each other?” All this makes you tired, tired of swimming upstream and fighting against the odds that seem so insurmountable that you think no one could ever win against them. This is what life is like for many women, even the successful ones. It is early days and we have centuries of behaviours and societal norms to change before we really see big changes in gender equality. These behaviours exist for both men and women and can be as simple as the belief by young women that she has to wait for the man to ask her to marry, instead of just asking him. All this waiting has the effect of silencing women, subordinating them to the backseat of decision-making. Of marking time until ‘something changes’, and ultimately it prevents many women from getting ‘off the sidelines’[ii] and getting on with it. In the workplace, many of our organisations are developing gender diversity policies to combat some of these issues. Some are more successful than others are, but the important thing is that we have begun. Now we need to really leverage these initiatives and turn theory and rhetoric into economic performance and a more equitable living condition for women and minorities. I believe that by ‘silencing’ the weary women we are constraining our ability to resolve many of the organisational performance issues that hamper our economies, largely because our organisational leaders don’t hear women’s voices often and loud enough – the voices that provide alternative views and ways of thinking. Australia has been relatively successful in increasing women’s participation in the workforce, but there is still a long way to go and many prejudices and discriminatory practices lie just beneath the surface. The new gender indicators introduced by legislation in 2012 by the Workplace Gender Equality Agency WGEA, 2012[iii], previously known as EEO, seeks to unmask some of these underlying and often hidden issues. “What is important to recognise is that an organisation’s gender culture is hidden behind the dominate rhetoric of equality, (Benschop and Doorewaad, 1998; Tienari et al., Ainsworth et al. (2009) in North-Samadizic (2011)[iv]. For example, in an analysis of reports to Australia’s EEO regulatory body, Ainsworth et al. (2009) demonstrated how organisations are blind to gender through unstated male norms that suppress gender differences“. North-Samadizic (2011). They gave the example of organisations stating in reports that gender is irrelevant or insignificant to the hiring and promotions process.” Therefore, gender structure, gender identity and gender symbolisism can limit equality if it is present in the ‘gendered subtexts of organisational rhetoric’ (Taska 2011). That is; although these organisations purport to have equality, assessments show there remains a bias’ in recruitment processes and within cultural behaviours themselves. Gender Symbolism and subtexts, both verbal and behavioural convey a set of ‘meanings’ that can maintain gender inequalities by quietly working to prevent change in environments where women are seen as the ‘other’. This plays into stranger theories where white male masculinity is the norm and the term ‘woman’ can hold less value that the term ‘man’. Now imagine a world where all the seen and unseen barriers to women’s success are removed and think about the incredible potential that is now unleashed. With economies struggling all over the globe, isn’t it about time we smashed through these barriers and took advantage of this potential. If women were a commodity (and sometimes they are seen as that), or assets in a storeroom any business would seek to improve that assets performance instead of marginalising it and leaving it to underperform. We don’t see women as a natural and valuable resource. We often see them as expendable as collateral damage in war or simply there to support others or provide menial labour, and worse we see them as a cost to society and our organisations because of their biology. This valuable biology carries the promise of new life, the birthing of children without which there would be no need for discussions about performance, economics and politics because simply, there would be no humankind. Why do we let the enormous potential of half this valuable population languish? Just think for a moment what it would be like to be freed of the expectations of physical beauty and the never-ending focus on sexiness and youth and instead we welcomed experience and substance. Imagine if it was just as easy for women to excel in their jobs and for female entrepreneurs to have the same access to capital as their male counterparts do because they are more able to tap into existing networks where capital raising is common. Imagine a world where stay at home parents were valued, able to nurture their families without the threat of poverty or losing valuable job experience at every turn. Imagine a world where we no longer referred to ‘the burden of childcare” and instead this cost was factored in across society because it is seen as valuable. Our economies would benefit from new industries and new ways of thinking instead of the current system that fails us at regular intervals because it is built on the boom and bust mentality of status, greed and power instead of sustainability and common sense. The finance sector takes pride in being able to predict the next bull or bear market instead of planning on sustainability and inclusion. In short, gender equality is essential to increasing economic sustainability, increasing organisational performance and breathing new life into the way we think, work and live. What a world it is going to be! From the Capgemini‘s Women in Management, Spotlight on Women in Management. I think it is important to note that whilst many of these responses could apply to both males and females, what is valuable is that these women can articulate what Gender Diversity brings to the organisation and why it is important. The strong message is that “diversity”, or diversity of thought is the key to increased business and personal performance, and I would argue it is also the key to sustainability, innovation and harmonious work environments. * ‘Women have the ability for increasing client intimacy and understanding’, helping clients to feel that the organisation is more inclusive and responsive to their needs. Research has suggested that improvements in client satisfaction is strongly linked to employee satisfaction and potentially this ability for understanding translates through work groups where the organisation is inclusive and diverse. * ‘They are more intuitive, they take more co-operative positions and offer more pragmatic solutions’. These last two bullet points could hold the key to the previous statement that ‘women have the ability to work [more effectively] with different cultures’ by being more inclusive, intuitively recognising difference between cultural boundaries and being able to offer co-operative rather than combative or competitive solutions. “In 2003, 8.5% of Capgemini UK’s Vice Presidents were women; today, that number has risen to just over 17%. In 2005, 46% of those accepted on Capgemini UK’s consultancy graduate scheme were women, and the proportion of women in senior management positions continues to grow. In 2007, 23% of newly promoted vice presidents at Capgemini were women.